If ever there was a crowd inclined to make Mayor Kevin Faulconer’s plan to get more San Diegans to bike to work happen, it was attendees at this weekend’s CicloSDias event. But many said there are a lot of roadblocks stopping them from biking to work. To get an idea of how far the city has to go to meet its goal of getting far more San Diegans to bike to work by 2035, consider this: Many of the people I spoke with at the bike-boosting event CicloSDias this weekend admitted they don’t bike to work. 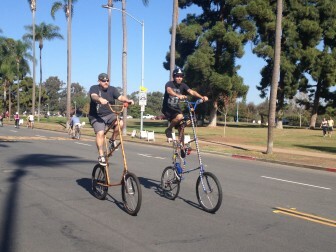 Now in its third iteration in San Diego, CicloSDias is a Sunday event where a stretch of a major roadway is closed to vehicle traffic, allowing only bicycles, pedestrians and whatever other funky ideas people have (unicycles and “tall bikes” were both spotted this time around) for sustainable transportation. This year, the event shut down around 20 blocks of University Avenue and Sixth Avenue along Balboa Park. Right now, only about 1 percent of people in those areas do that. If ever there was a crowd inclined to make Faulconer’s plan to get more San Diegans to bike to work happen, CicloSDias was it. And yet, many of the people I spoke with said that there are major impediments keeping them from commuting by bike — a sobering reality that drives home just how far the city has to go as it begins the slow work of implementing plans and infrastructure to coax commuters out of their cars. Corey Lane, a Hillcrest resident who commutes every day to Sorrento Valley for his job at second-hand tech re-seller EcoATM, said that the distance alone was enough to make biking to work a bad option. Bryan Bagnall, Lane’s friend who works at the Navy’s SPAWAR in Point Loma, agreed that distance was a factor – along with San Diego’s hilly landscape. Got that, city officials? All you have to do is smoosh sprawling neighborhoods closer together, and rearrange the city so all jobs are located at the bottom of a hill. Other people suggested some more viable improvements that would bolster the chances they’d ditch their cars for a commute. Sonia, who works in the medical field in La Mesa and lives in East County, and who declined to give her last name, said she would bike to work if there were major improvements to transportation culture and infrastructure. Planners actually have a name for this breed of cyclists: “interested, yet concerned.” And they can take some comfort in SANDAG’s Regional Bicycle Plan, which includes infrastructure improvements. The city’s carrying out its own efforts, too, such as adding bike lanes on Fourth and Fifth avenues with buffers. For Teddy Park, 38, bike lanes created solely with paint and no physical barriers from traffic just don’t offer enough protection. Some people at the event did say that they already bike to work. Don Strazzabosco has commuted to work by bike for 14 years. But Strazzabosco acknowledged there could be improvements to his bike route along Kearney Villa Road from Scripps Ranch to Kearney Mesa. He said that cars often go upward of 70 miles per hour there, and bikers are only separated from those cars by painted lines. “It needs to have a stand-alone bikeway, or one of those concrete barriers,” Strazzabosco said. Tanya Pulley, 28, also commutes by bike to the various homes where she serves as a pet caretaker. But in areas like Rosecrans Street in the Midway district, she doesn’t even bother with streets because of potholes and heavy traffic. She also said that the newly implemented three-foot law has had little effect on driver behavior, though she doesn’t necessarily blame the drivers because a lack of buffered bike lanes makes it difficult for drivers to maintain that distance. Clarification: An earlier version of this post said CicloSDias is in its third year. It has held three events in two years. Matthew is a freelance contributor to Voice of San Diego. You can reach him at matthew.hose@voiceofsandiego.org.